With Lewis Hamilton seemingly set for a comfortable victory on lap 25, Kevin Magnussen’s Haas was forced to stop in an unsafe position, bringing out the virtual safety car. Here’s where it gets interesting. Hamilton had already made his first stop and, although marginally behind Vettel on the track, should have had plenty in hand to remain in the lead after his rival’s stop. Sensing their opportunity, Ferrari called Vettel in for his tyre stop, allowed under virtual safety car conditions. They knew that under the sporting regulations, Hamilton would be limited to a track speed to a minimum time set by the FIA and this being so, Vettel was able to emerge marginally ahead of the Mercedes. Had Hamilton been going at his usual race pace, victory would have been a formality. As it was, he was left scratching his head along with the watching fans. The response was perhaps not one that he wanted to hear. “Lewis, we thought we were safe but there’s obviously something wrong.” Try as he might on a circuit where overtaking is at a premium, Hamilton could not force his way past. So why did Mercedes get it so wrong? In a sport where computers analyze data to predict all scenarios to fractions of a second, surely this never should have happened? It appears that Mercedes’ system had not correctly calculated the gaps during a close race. With Formula 1 teams blindly relying on data and race simulations, a software glitch like that came as an expensive surprise. While we’re bound to see further analysis of the situation and detailed explanation of what exactly went wrong, one thing remains clear: data is king in Formula 1. Data shapes the teams’ strategy and rules drivers’ decision. At the end of the season, where even one point can make the difference in terms of millions of dollars, last weekend’s software glitch could yet prove a costly mistake. 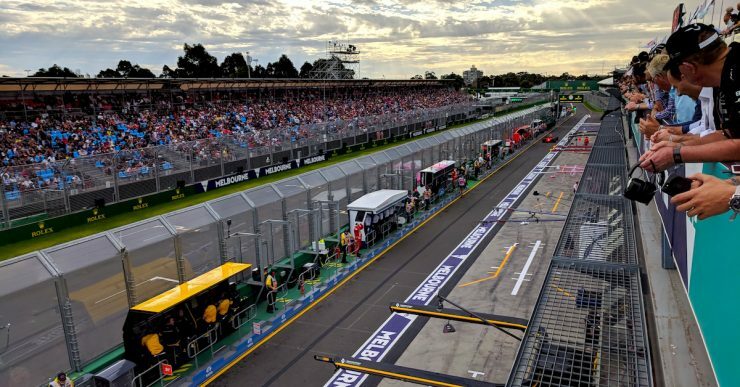 Top Image: Formula 1 pit lane at Melbourne Grand Prix Circuit. © Acronis.